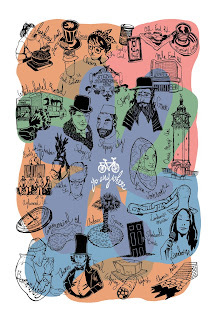 I'm glad that last week I managed to submit my entry to the Secret London competition run by Serco and the AOI. Illustrating hidden aspects of the capital immediately appealed me and spent long time thinking about which part of London to focus on, finally deciding to do it on an area I know well, the East End. An aspect of London that keeps surprising me is the amazing streets and squares that remain tucked away off main roads, that seem to be only for the locals' pleasure as someone non-familiar with the area would hardly venture off the high street unless I imagine to see a friend... In my case, a bike opened me this world that makes quite a contrast with my hometown Barcelona, where shops and bars are scattered about so it's easy to find oneself looking around deep parts of the district. This illustration is a mind map of the East End as it is in my head after 3 years living and cycling about in Tower Hamlets. Stepney then, is in the centre of the map and around it different aspects of life in the area, covering past and present and focusing on culture, people and food. The colours in the background are those of the Underground lines that serve the area, mainly the Overground, DLR and the District and Central lines. Blue in the middle shows the area of influence of a bike with which one can go anywhere and is the healthier and greener way to enjoy the hidden gems of this rich and not so much known part of London. looks really good - good luck with the competition!